Late yesterday I posted about the Education Department (ED) new College Scorecard and how it omits a large number of community colleges based on an arbitrary metric. I am not quite confident that the explanation for the vast majority of missing schools is based on this finding. In short, if an institutions awards more certificates than degrees, ED removes them from the public-facing website even if they are technically degree-granting institutions. Originally it appeared this situation encompassed 17% of all community colleges, but further analysis shows it to be more significant. Rather than using the official IPEDS definition of sector (public 4-year, public 2-year, etc), the College Scorecard looks at the largest number of degrees awarded and uses an Associate's or Bachelor's classification. This primarily affects community colleges that offer bachelor's programs but the majority of graduating students get two-year Associate's degrees. Think of the recent legislation in California to allow certain community colleges to offer new bachelor's programs. To account for this definition, I took the IPEDS data (2012-13 school year) and created new 'sectors' called Public 4-year AD, Private 4-year AD, and For-profit 4-year AD, with the AD standing for Associate's Degrees. I then combined these AD schools with the corresponding Public 2-year, Private 2-year, and For-profit 2-year schools into a Combined Public Associate's, Combined Private Associate's, and Combined For-profit Associate's category. The result: I can now come close to matching the results of the College Scorecard, meaning that this definition (called Brian Criteria after the commenter who described it on Stack Exchange) does indeed account a large majority of the missing institutions. The numbers are even bigger than I thought. 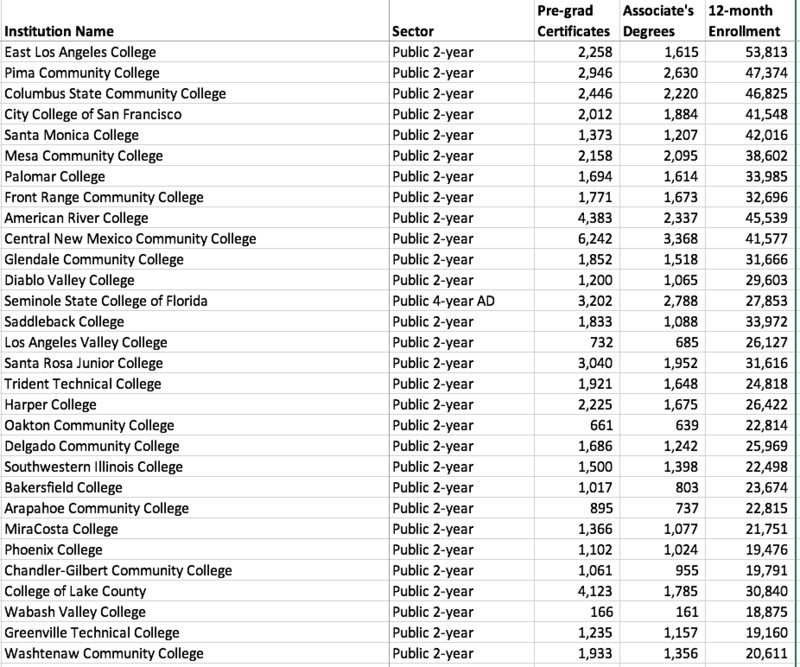 Fully one in four Public Associate's Degree institutions (mostly community colleges) are not listed on College Scorecard. More than four in ten For-profit Associate's Degree institutions are not listed. Overall, almost one in three Associate's Degree institutions are not listed. These categories account for almost half of all US postsecondary students. Cali Morrison from WCET described a big problem with this approach by email. In my opinion, where this hurts the most is in promoting to potential students the idea of stackable credentials. Many of these certificates are awarded as an interim step to an associate degree. They are high quality certificates that lead to job potential and contribute to a student's eventual degree. These institutions not appearing on this touted 'good data' site, produced by the government may make some students shy away from what could be a really useful, and employable credential.